Two separate creek channels converge in Forked Canyon as it drains from east to west towards its confluence with Honeycut Hollow Creek. Forked Creek passes by the eastern edge of the rock wall complex first mentioned in the Turkey Canyon watershed. 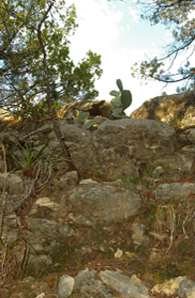 In this area, sections of the rock wall still stand four to five feet high. The lower elevations of this watershed contain large oak motts where several 100+-year-old live oaks can be found. Ashe juniper (Juniperus ashei) and prickly pear cactus (Opuntia engelmannii) along the rim of Forked Canyon. Ashe juniper (Juniperus ashei) and prickly pear cactus (Opuntia engelmannii) grow along the rim of Forked Canyon. A travertine shelf can be found on the south branch of Forked Canyon. Travertine occurs when carbon-dioxide-rich water contacts limestone, which precipitates the calcium carbonate out of the limestone. As the solution changes in temperature, the carbon dioxide is released as a gas, and the carbonate minerals recrystallize, forming travertine. Elevation Model of Forked Canyon. Satellite Image of Forked Canyon.